More on our ride here and here. 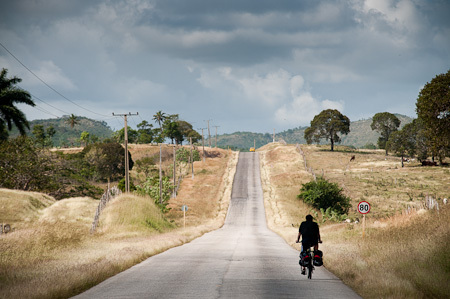 Cuba makes an ideal introduction to bike touring: it’s easy to get refreshingly off-the-beaten-track, places to stay are well within two-wheeled striking distance, the terrain is flat(ish) and it’s very safe. Flick on the salsa soundtrack, throw in a string of beautiful beaches and sprinkle with stunning colonial towns, and you have all the ingredients for a great ride. With this in mind, I’ve written an overview of our route, a little about the casa particular system, some insights into negotiating Cuba’s crazing dual currency system and a brief rundown of the kit I took with me. Lightweight touring in timewarped Cuba. 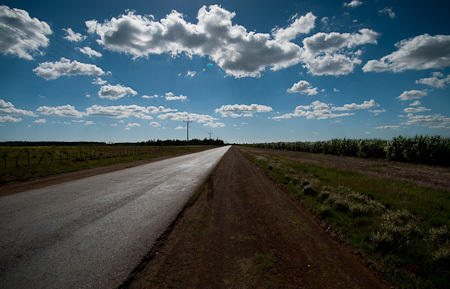 We bused out to Cienfuegos (5 hours, 20 CUC, no problems with the bike) then began the ride. First we looped around Central Cuba, stopping off in Santa Clara, Remedios (highly recommended), Santi Spiritus, Trinidad (with a detour to La Boca and Playa Ancon), Playa Giron, Australia, Matanzas (with a detour to Playa Coral) and back to Havana. Given the flat to rolling terrain, this made for a very enjoyable, easy going tour. We gave ourselves a couple of days in Havana (an incredible place, and easily seen on foot) and cycled all but one day. Covering 60-95kms a day allowed us time to stop for swims/food forrages and to explore each town when we arrived. We probably cycled around 800kms in total, over two weeks. Although there’s plenty of mountains in Cuba, the terrain on our route was never worse than rolling. 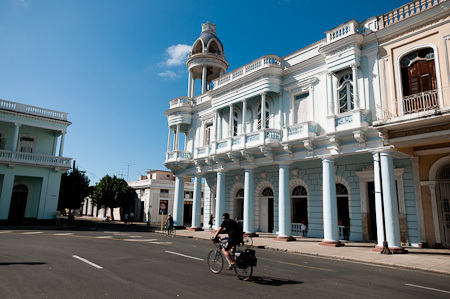 Traffic free riding in Cuba’s beautiful colonial towns. 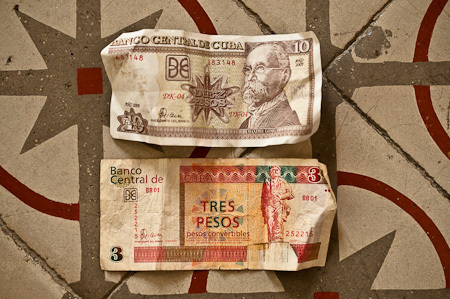 There are two currencies systems in Cuba, the Peso Convertible (CUC) and the Peso National. CUCs are used for the likes of accommodation, internet and more expensive food, while Pesos are better for street snacks, fruit and local drinks. At the time of writing, the exchange rate was around 0.9 CUC to the US dollar, and 1.4 to the GBP. However, it’s best not to bring any greenbacks, as these incur a hefty 20% penalty when you change them. All other currencies are commission free, and you can change money at either one of the banks or the cadecas (exchanges). Cadecas will also change your CUCs (tourist cash) into Pesos Nationales (local cash), at a rate of 24 to 1. Once you get your head round it, it’s all very easy and above board. If you really want to do Cuba on the cheap and hang with the locals, this is the way to go. Just a few dollars worth of pesos will last you days – most back-of-beyond sandwiches won’t cost more than a few pesos, and even a pizza with all the trimmings won’t set you back more than 10. You can sometimes pay with CUCs and get change in pesos. Look out for the three peso coin, which has a picture of Che on it. Overall, we spent around $24 dollars a day, excluding a dollar or two for the odd beer (neither of us are big drinkers). This included massive dinners and breakfasts in our casas, and cheap lunches in backwater towns. It excludes very occasional internet use and our bus ride to Cienfuegos. You’ll need a $15-20 Tourist Card, depending on where you’re flying from. From Central America, you can get this on the plane, and in the UK, my brother went to the Cuban embassy in London. We’d heard about a daily insurance exclusive to Cuba, to be paid upon arrival. However, we passed through immigration without being asked, so it looks like there’s not the infrastructure to support this quite yet. When it comes to leaving the country, you’ll also need to keep 25CUC handy to pay the exit tax. My usual style of touring involves mixing camping with cheap guesthouses, both to save money and because I love pitching my tent in the wilds. Cuba proved a little different. Although camping is perfectly possible, from what I understand it’s officially illegal unless in one of the recognised sites, thus requiring more of a stealth approach. Since our trip was relatively short, we traveled extra light and treated ourselves tocasa particularesevery night. Casas Particulares are the Cuban equivalent of a B&B. Although their 20 CUC price came as something of a shock (to me, at least), they’re actually really good value when split between two, considering what you get. The en suite rooms were invariably pristine (many had a fridge too), full of character and run by ultra friendly hosts. Towels are included, just don’t expect a brand new bar of soap (something of a luxury item it would seem, judging by the amount of random people who asked us for soap in the street). We generally shopped around when we arrived in each town, allowing us some scope to negotiate. Jineteros (touts) often tried to coax us over with promises of 15 CUC deals, but we steered clear of them and stuck to the 20 CUC options. You’ll know the official ones as they have a little T-shaped blue emblem on the door. Casa owners can ring ahead and book you in with one of their friends if you want. Bear in mind that we were travelling on the cusp of the high season, and that casa owners are due for a hefty increase in the taxes they pay to the government, so this will probably be reflected in some price rises. I haven’t listed all the places we stayed in, but see addresses below for the places I’d really recommend. Vicenta, the maternal owner of our casa particular in Playa Giron, called us ‘mi amores’, plied us with food, delighted in sharing Nick’s family photos and treated us to her homemade mango jam. Retired after 38 years as a pharmacist, she used money from running a casa paricular to supplement her 8 CUC a month government pension. We invariably ate breakfast and dinner in our casa, simply because the food was so good. 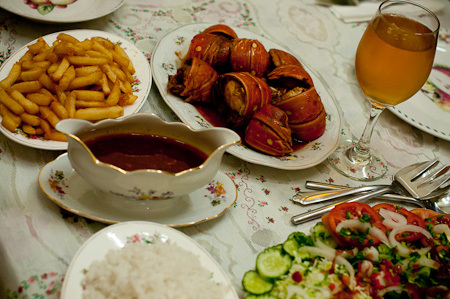 Dinner typically cost 8 CUC, and for this we could expect a veritable feast of fish/chicken/pork, or even lobster. This would be supplemented with a hetfy serving of rice, perhaps a bean soup, a mound of salad, some form of potato side dish, and sometimes even a fruit salad. Breakfast set us back 3 CUC, and was plentiful too: a tankard of fresh juice, a platter of fruit, bread, butter, honey, omelets and coffee. Each casa invariably had its own little twist on this formula, giving us plenty to discuss as we ate. A lobster feast like this set us back 8 CUCs. About 9 dollars. To balance out our CUC accommodation, we only spent peso nationales during the day at local eateries. Hygene can sometimes look a touch iffy, but neither of us were ever ill. A dollar or two will cover pizzas, sandwiches, snacks and fruit for the day. It’s that cheap. The food is pretty basic, though if you nose down some side alleys, you’ll often come across various Cuban culinary oddities that are always worth a whirl. A loaf of bread is a few pesos, so bring some peanut butter from home, or buy some honey in Cuba. Most towns should have a basic selection of cheap street food, though Sundays can be a little sketchy. More good news: Cubans love their ice cream. If you can’t track any down, ask the kids. 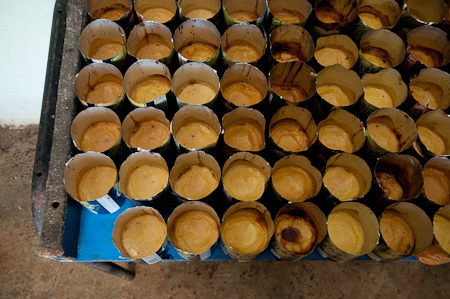 These creme caramels were made using recycled aluminium drinks cans. Except where locals advised otherwise, I drank the local water. We generally guzzled plenty of liquids in the morning, in the form of fresh guava juice in our casa. A few casas provided filtered or boiled water, while others charged for bottled water. You’ll often see signs for refrescos, in hole-in-the-wall eateries or simply tacked to someones door, which are one peso a glass. Some use fruit (natural), most are straight from a packet. Batidos, at two pesos or so, were the business: a fresh fruit milkshake with enough ice to give you an ice cream headache. The fruita bomba seems to be a national favourite. A can of soda will set you back 10 pesos or half a CUC, while a1.5l of bottled water is 70c, and found in any of the dollar stores. Nick rated the Cuban coffee, served at breakfast and dinner in your casa, or from a grubby hole-in-the-wall eatery for one peso a pop. Taking a bath, Cuban style. I managed to poach a free signal at Havana’s National Hotel, but what was the extent of wifi for the trip. For internet access, you can buy scratch cards from Etecsa, the telecoms company, allowing you to log on and off at different locations, until your credit is used up. The charge is 6 CUCs an hour, and speeds tended to be a little on the slow side. Best to do all your research and make your printouts before arriving. There are no website restrictions, though it seems Cubans can only access a more limited selection of websites at internet cafes closed to foreigners. We both rode mountain bikes, my Thorn Sterling and Nick’s Specialized Rockhopper. I went ultralight on this trip, as we weren’t carrying any camping kit. I didn’t even need a rear rack or panniers, as my framebag, seat bag and bar bag combo provided ample space. Nick had a small bar bag and two rear panniers, with loads of room to spare. We never had any security concerns, but we were often told to keep an eye on our steeds, as opportunist bike theft is apparently common in Cuba. I went light, and used my Porcelain Rocket framebag and accompanying kit. No need for panniers on this trip as we weren’t camping. 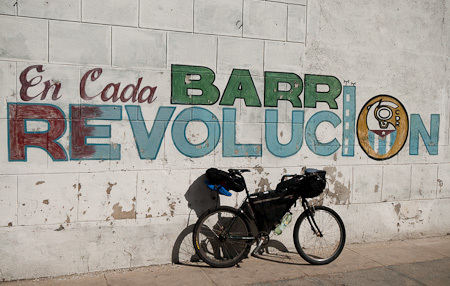 Bicitaxis: with so few cars about, Cuba’s bike culture is thriving. Nick ran Specialized Armadillo 1.5s, which are probably your best bet for the predominantly paved roads of Cuba. I bought a couple of fat, 2.2in slick tyres in Guatemala for just $5 dollars a piece. Normally I’d carry a spare folding tyre, but as I was carrying so little, I figured I was unlikely to have any problems. If you’re running 700c tyres, bring a spare and stick with 32c or above, as some of the backroads are a little bumpy. We did see a pack of seventy (yes, seventy!) riders from Austria, Germany and Switzerland on sleek roadbikes, though they were vehicle supported and keeping to highways. Cubans will hanker after your tyres, as only cheap Chinese ones are available. Most Cuban roads are pretty good quality, though backroads can be a little bumpy, as can the cobbly colonial towns. On the whole, Cuban roads are eerily quiet, and what traffic there is tends to be sympathetic to bicycles. On our loop, the stretches between Cienfuegos and Santa Clara, and from Australia to Matanzas, were a little busy. With Cuba’s fleet of ancient vehicles, prepare to be occasionally engulfed by a cloud of noxious fumes, often just as you’re cresting a hill. Most cars give you plenty of space. Beware the old Plymouths and their noxious fumes. I flew from Guatemala with Copa and Nick from London with Iberia, and neither of us had to pay for our bikes, which was a bonus. When we arrived at the airport at 10pm, the taxi we took into the centre (25 CUCs). Then we left our box and bike bag at the casa particular. On the way back, I rode the 25kms out to the airport with my Ground Effect Bodybag and a load of cardboard (I’d heard it was hard to find at the airport), then packed up my bike there, to save the taxi fare. Easy to find, and takes an hour to an hour and a half. Note that anything you have left over will be gladly received by Cuban cyclists, who hunger for quality parts – particularly tyres, as there are only low grade Chinese ones available in Cuba. I haven’t listed all the casas we stayed in. These are the ones I’d really recommend either for great food, pristine rooms or maternal owners who ensured we were well fed and watered. notes: very kind and maternal, called us mi amor! This entry was posted in Cuba, Pack Lists and tagged Cuba, cycling, Kit List on December 15, 2010 by Cass Gilbert. Thanks for providing such a great account of your trip. I can’t wait to plan a similar adventure! Thanks a lot, Cass. This account will really help me with my planning for a 3-week tour coming up in mid-November. I’m thinking of leaving my camping stuff behind now. And my fears about drinking the local water and eating the local food have been abated too. It’s certainly possible to camp, but we really enjoyed the social aspect of B&Bs (cheaper if you’re travelling as a pair). And, they’re well spaced apart for a decent day’s ride. Great account. Can’t wait to plan to ride. Can you rent bikes in Havana? 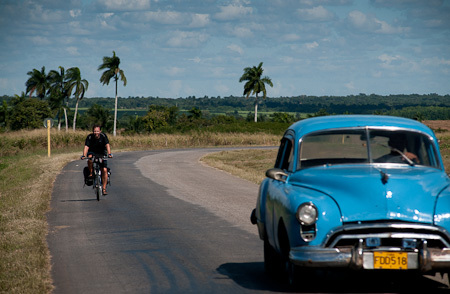 1) Have chat with a friend tonight about doing a bike trip about Cuba. Thanks for the comment. Glad it’s been of use! Great write-up Cass! I hope to travel to Cuba at the end of the year under licensed travel. What are the prevailing winds and how did that affect your route choice? In the US the rules are West to East and if you do the West Coast, go south. What are the wind-friendly rules for Cuba? The general rule is that the wind blow east to west. So, best to catch a bus out of Havana, and ride back – which is what we did. Worked out well. Me and my friend spent 2 months cycling all over cuba got lots of information on were we went and stayed on our tour if anybody needs it was amazing cheers Tony . Hi! It would be awesome if you could share your infos! We are off to Cuba in August and we will be staying there for three weeks. We are flying in and out from Havanna. So we are thinking about doing a loop to the west (all the way to Pinar del Rio/Maria la Gorda) and then take a Bus to Cienfuegos to do a central loop. Sounds great Livia. I have a few more Cuba posts on the blog for some of those areas that may be of interest. I heard the the most westerly points are fantastic. Great account….and all your tips will be of massive help to us this Nov.
1 Do we need to book the bikes? 3 Is there a charge for the bikes? 4 Where are they stowed while travelling? 2. A wheel may need to be taken off, but nothing major. 4. Under the bus. Safe and sound! All the best for your Cuban travels! Nice, informative account. 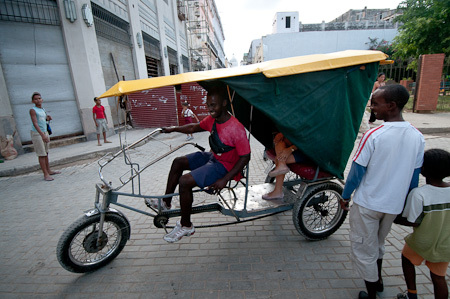 Have you any thoughts about cycling with recumbent trikes in Cuba? Especially concerning internal travel by bus, for example. I can’t see there would be any problem putting a recumbent on a bus – from what I remember, there was plenty of room. I’m sure you’d get an amazing reactions from the locals! Hi, read your blog with interest. 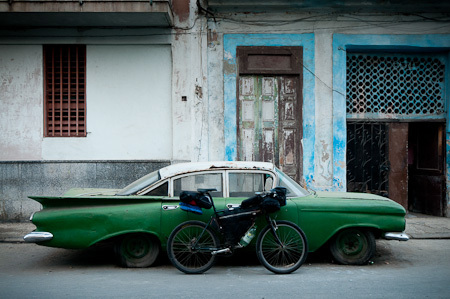 Never done anything like this before but I shall be on my own and I was thinking of going to Cuba for cycle training. It would be cheaper and more off the beaten track than Spain. But I was really thinking of one place for 10 days with easy access to hills for the training. The bars and social are not my concern, the training is. Is the place safe? Could you suggest anything? Hey Tommy, can’t offer more advice than the blog posts I wrote up I’m afraid, as details are a little hazy this far on – and things tend to change. But safety was never an issue – even wandering around big cities in the evening. 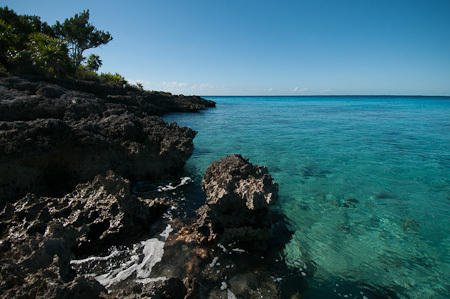 This may well change as Cuba opens up, but for now, it’s a haven in that regard. I don’t think you’d regret a visit – it’s a world apart from Spain culturally, and there are plenty of hills to be found if that’s your focus. We kept to a fairly mellow route as I was riding with my brother, who doesn’t get the chance to tour much. Enjoy!